Did you know: The average household has more than 10,000 photos in shoeboxes, spanning generations that need to be digitized, but how? 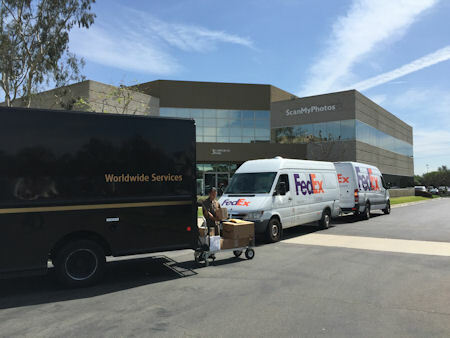 (Irvine, CA) -- Free shipping and scanning 10,000 photographs for $495.00 with same day turnaround is the next "new-new thing" in digital imaging, according to the Photo Preservation Center, which says "many households collectively have more than 10,000 analogy photo snapshots stored away in shoeboxes." [click here to order]. The problem was how to safely and affordably have an entire family's generations of pictures scanned and mailed back the same day? To help promote photo scanning and solve the challenge, today, the Photo Preservation Center is launching The Great American Photo Scanning Project. Its goal is to scan millions of pictures through local photo retailers which are networked through directories on two leading photo imaging associations and through the nationwide ScanMyPhotos.com service for high-volume scanning. (See http://www.PhotoPreservation.org). ScanMyPhotos.com, which commercialized super-fast photo scanning and provides a menu of other digital imaging services is hosting an upgraded program for The Great American Photo Scanning Project. With a few clicks on the keyboard, in under two-minutes, consumers start the process to have 10,000 of their photos scanned when they order the Family Generations Collection prepaid boxes. Afterwards, they design their own photo albums from their scanned photo memories. "The Kodak scanning and software technology that powers ScanMyPhotos.com provides for safe, fast, affordable and reliable service. Now, it's as fast as a few clicks on the ScanMyPhotos.com website to order either a single or multiple prepaid fill-the-box service," said Mitch Goldstone, president and CEO of ScanMyPhotos.com and chairman of the Photo Preservation Center. Then, just like the celebrated Kodak slogan, "You Press the Button We Do the Rest," the newest service includes safely sending out six co-branded U.S. Postal Service Priority Mail prepaid boxes. Combined, it supports more than 10,000 standard photographs that consumers pack up and drop off at their local Post Office. ScanMyPhotos.com does the rest with same day scanning and return. Their Family Generation Collection includes two complimentary custom photo memory albums designed using ScanMyPhotos.com's online digital imaging service. + Two Photo Memory Albums that the customer designs, chooses the photos, journals with custom text and adds their selected backgrounds and templates to personalize each hardcover bound album using the ScanMyPhotos.com online photo imaging service. ScanMyPhotos.com is famous for its digital imaging and nationwide fill-the-box scanning, but was faced with a challenge to expand the service after its involvement with the recent 2008 Artistry of Genealogy Awards. According to Goldstone, "the genesis for the expanded 10,000 prepaid photo scanning service was based on many family historians asking for even larger packages to ship their photos in. They liked the flat-fee and same day service, but wanted something more." More info, see ScanMyPhotos.com. For daily news and super-savings updates, visit their Blog: Tales from the World of Photo Scanning (http://www.Blog.ScanMyPhotos.com). The Photo Preservation Center is sponsored by ScanMyPhotos.com.